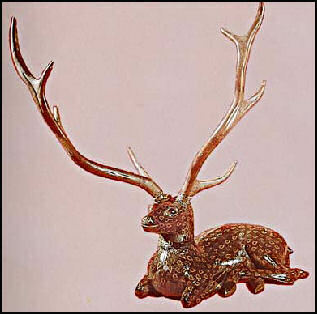 Warring States period lacquer deer Chinese crafts and craft objects include ceramics, porcelain, enamel, carvings, furniture, lacquerware, tapestry, embroidery, clothing, uniforms, jewelry, sacred objects, weapons and kites. In Imperial times, luxury art and crafts were indications of status and there was a certain hierarchy among the individual crafts. Jade carvings and lacquerware were more highly esteemed than ceramics. Jade was especially prized because of it symbolic value and the fact it was difficult to carve. 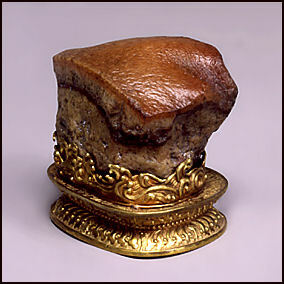 Among some Chinese scholars rocks are regarded as works of art. The best stones are asymmetrical yet proportioned; with striking colors and pattern; interesting to look from all sides; and suggesting natural forms. Some are polished, and oiled. Other are sawn to give them a flat base. The best ones are created entirely by nature. Sometimes obscure Chinese objects can be of great value to modern collectors. A calligraphy brush washer from the Southern Song dynasty sold for an astonishing $1.2 million at a Sotheby’s auction. Chinoiserie refers to objects made in China for export and “fakes” in a similar vein made by Western craftsmen and adapted to make them palatable to local tastes. The term implies a certain amount of tackiness and garishness with the most extravagant pieces being Gothic and rococo monstrosities with dragons and Chinese lions instead of cherubs and demons. The peak of Chinoiserie art was the mid 18th century when the fascination of things from the Orient was at its height in Britain. Pieces were often made for women and the tea party set and were associated with having affairs. Gardens University of Washington washington.edu ; China Planner chinaplanner.com ; Garden Photos flora.huh.harvard.edu ; Chinese Bonsai China Vista ; Suzhou Travel China Guide Travel China Guide Wikipedia Wikipedia ; Lonely Planet Lonely Planet China Map Guide China Map Guide ; Suzhou's Gardens: China.org China.org ; Suzhou government Suzhou ; UNESCO World Heritage Site : (click 1001wonders.org at the bottom): UNESCO ; UNESCO World Heritage Site Web site (click the site you want) World Heritage Site ; Book The Chinese Garden by Maggie Keswick (St. Martin's Press). Crafts from the Qing period period (1644-1911) were particularly ornate. Incorporating Tibetan, Middle Eastern, Indian and European influences, it included elaborately carved wood, baroque ceramics, heavily embroidered garments, and intricately worked gold and rhinoceros horn. Among the more extravagant pieces of Qing art are silk costumes made with applique embroidery; a royal hat made of sable, silk floss, gold, pearls and feathers; and a five-foot-high cloisonne elephant with a lamp on its back. Carvings can be considered one of the earliest forms of Chinese art. The ancient Chinese carved objects from jade, stone, bamboo, wood, bone, horn, teeth and other materials. Six-thousand-year-old ivory combs and ivory carvings have been found at the Neolithic Ta-wen-k'ou cultural site in Shandong Province. The middle of the Ming dynasty is considered the golden age of Chinese carving. Palace artisans and highly skilled profession carvers produced stone carving in Chia-ting and Fukein provinces, bamboo carvings in Nanking and Chia-ting, hardwood furniture in Kuangchou and Yangchou, boxwood carvings in Chekiang, ivory carvings at the Kuangchou School, and "green leaf bamboo carving" at the Chia-ting School. The ivory carvings of the Kuangchou school were noted for their extremely fine and delicate linework as well as their ivory thread embroidery. The Beijing School excelled in free-standing ivory figures and colored, inlaid ivory work. One of the most awesome works of art at the National Palace Museum in Taipei is an elaborate ivory sculpture about a meter high, filled with intricate designs and detailed latticework, that took three generations to make. 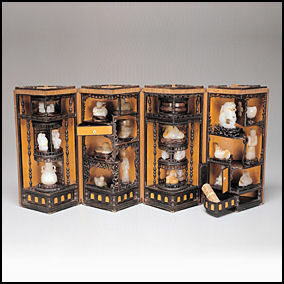 Chinese also carved figures and objects from bamboo-root, rhinoceros horn, fruit pits and nutshells. Ming-era bed Traditional furniture includes elegant pear-wood folding chairs, couch beds, calligraphy tables, six-poster canopy beds carved with dragon motifs and covered with yellow brocade, garment racks, and bamboo chairs carved with the "three friends of winter" (bamboo, plums and pine trees). Prized Ming and Qing dynasty furniture from the 17th, 18th and 19th centuries includes altar tables, coffers, stools, stands and chairs. Antique Chinese furniture was built without nails. Pieces were fit together like puzzles and assembled with Chinese characters that were associated with poetry and calligraphy. Huanhuali, a Chinese hardwood, has traditionally been treasured for furniture making. It can be polished to bright sheen but is difficult to carve. Chinese folding chairs are built to come apart and be folded so they can be carried under the arm of one person. They feature serpentine wooden armrests, anchored by tendons, that easily flip up, allowing the seat and back to go flat. The headrest and footrest also fold flat. Unlike Chinese scholar's chair, which all are all form and no function, the folding chairs and both beautiful and comfortable to sit in. Chinese screens have traditionally been important objects of furniture. Prized antique ones have 12 panels and are 11 feet tall. Made of hunaghuali, they feature upper panels incised with images of scholar's objects, and lower panels covered by cloth painted with landscapes and calligraphy. Embroidery has traditionally been a skill practiced by nearly all Chinese women. 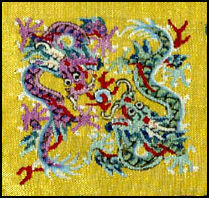 Silk embroidery developed very early in China, perhaps as early as 2200 B.C. 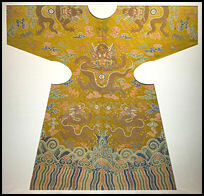 Up until the Tang dynasty (618-906), it was used mainly to decorate clothing and other objects. From the Tang Dynasty on, it was also used to represent calligraphy and paintings. Introduced by the Uygurs in northwestern China, tapestry art began in China during the Southern Sung Dynasty (1127-1279 A.D.), also considered to be the golden age of China tapestry. Most of the tapestries seen today are from the Ming (1368-1644) and Qing (1644-1911) dynasties. Detailed Qing tapestries are often half-tapestry and half-painting. Hand knitted and hand tufted carpets from China. Imperial robe three sets of clothing: regular, court and ceremonial. Imperial clothes were made with silk, gold, sliver, pearls, jade, rubies, sapphires, coral, lapis lazuli, turquoise, agate, various kind of fragrant woods, kingfisher feathers and thread made from peacock feathers. Beginning in the Sui dynasty (581-618 A.D.) the emperor appropriated the color yellow and prohibited other people from wearing it based on a purported precedent set by the legendary Yellow Emperor. During the Qing dynasty the ranks of courtiers and bureaucrats were indicated by decorative designs on their costumes, the number of peacock feathers on their hats and the number of precious materials they were allowed to wear. For example, the formal over-robe worn by a first degree civil servant was embroidered with a crane while that of a second degree civil servant was embroidered with a golden pheasant. Robes of lower ranking officials were decorated with other animals. Color also indicated rank. Brilliant yellow was reserved for the Emperor. Muted yellows were worn by his underlings. Kite-making and flying are considered artforms and kitemakers are regarded as artists. The best kites are made of wafer-thin bamboo strips, fine silk, string, and glue with skills that been passed down through generations. The Chinese have been making kites for thousands of years. Some of China's most famous kites were made at the beginning of this century by a major craftsman named Wei Yuan Tai. Constructed of brocade and silk wrapped around a bamboo frame, these kites were reportedly so appealing that flocks of birds sometimes joined them in the sky. Tianjing and Beijing both have kite-flying clubs and kite-making factories. Other crafted objects include things like pigeon whistles, cricket cages and molded gourds. Pigeon whistles are tied to the birds so they whistle when the pigeon flies. The whistles have been around for more than a thousand years and peaked in terms of craftsmanship in the mid-18th century. Molded gourds have traditionally been made for singing insects such as crickets. They were built to resonate and their shape varied in accordance with the type and size of the insect they housed. The gourds are molded on the vine in carved wooden molds, hollowed, dyed and lined, for acoustic reasons, with mud composed of limestone, yellow earth and sand. Dangcheng, a town of 20,000 people 240 km (150 miles) southwest of Beijing, lies at the center of a major stone-sculpture production area. The works sell for hundreds to hundreds of thousands of dollars, depending on their size, intricacy and quality of stone. In recent years the stone workshops have fallen on hard times. Asked about their deepest worries, sculpture workshop bosses here almost always named rising wages, the growing cost of stone and transport charges. "I'm more worried about labour costs than about the euro," said Lu Xuhui, a 34-year-old owner of a sculpture company that has relied on orders from Italy, France and the United States. "The European market is very, very tough. Prices we can charge are very low, but wages keep going up, and prices for stone are way up too, so our profits are tiny," said Lu. Masons and stone workers in the town mostly said their incomes had risen from 3,000-4,000 yuan three years ago to 5,000 to 6,000 yuan or more now, depending on their level of skill. A cubic metre of white marble hauled from Hunan province in southern China now costs about 3,700 yuan, compared with 2,000 yuan three years ago, largely due to rising transport costs, said Lu Xuhui, the sculpture trader. Dangcheng applied the traditional stone-carving skills of this rocky part of Hebei province to boom as an exporter of ornate statues, busts, reliefs and fountains to Europe and North America. Now the town is struggling with the deep slump in once vibrant markets, especially Italy and other euro zone countries. "The boss ran away, they say. He went broke a year or two ago. Don't know where he went," said Lu Jiguang, a brawny mason from a nearby workshop who stopped by the locked gate. "There haven't been that many bankruptcies here. Most people find a way to get by, but business is certainly hard going," continued Lu, with the same stone dust-covered features and gnarled hands as nearly most other residents of the town. "I've seen reports about the financial crisis in Europe on television," he said. "It's also had a bad effect here." Dangcheng is a microcosm of the risks that slowing exports pose for China . The extended euro crisis and U.S. doldrums have mauled business, forcing some workshops to shut and many more to scale back or move. "Italy is dead for us now," said Wu Huanzhen, a co-owner of the Shuangfei Sculpture Workshop in the town. "When business was good, we exported about 900,000 yuan a year," she said, adding those most of those orders went to Italy. "This year we might clear 300,000 yuan, if we get some more orders soon," she said in a yard strewn with statues. Wang Shixiong, a deputy director of the Quyang county office for the sculpture industry, said he could not give recent statistics for exports. They had fallen so far that his office had given up trying to collect numbers, he said. "The financial crisis has been a huge blow here," said Wang. "The impact has been so bad that the businesses won't tell us their export numbers anymore, because they could look too bad in front of their competition. So we can't collect them." Growing domestic prosperity and some loosening of Communist Party controls on churches have offered an escape route from disappearing foreign orders, Lu said, above a din of electric grinding and chiseling. "We haven't had a foreign order since summer. Europe was our biggest buyer, but not now," said Lu, who like nearly everyone in the Dangcheng sculpture trade is a local. "We used to focus on exports, but they're no good now, so now we're focusing on domestic buyers," he added. Exports now account for only a few percent of the county's sculpture trade, Wang guessed. "Now it's basically all domestic," he said. For now, domestic sales and a trickle of export sales have helped offset rising costs, but profit margins are dangerously thin, said the trader Lu. "In 2009 we switched our focus to domestic customers, but that's starting to fall off too," said Peng Xuefeng, as he supervised workers grinding away at seven statues of Jesus Christ. He wasn't sure if the order, made through a trading agent, was destined for home or abroad. "Before, local (Chinese) governments and real estate developers were ordering lots, but domestic orders have been falling off too," Peng said above the screech of grinders.